As tensions on the Korean Peninsula mount, I thought about a story I heard many years ago. It was 2003, and the U.S. was preparing to invade Iraq. For the first time in my investing career, I faced the prospect of trading the start of a war. I called a friend who had more than 50 years of experience. He began working at the New York Stock Exchange in October 1962. That month, the Cuban missile crisis sparked a sell-off. Nuclear war was a real possibility. The Dow Jones Industrial Average lost more than 5% in less than two weeks. With sell orders pouring in, my then-young friend asked his boss what to do. The answer was quick: “Buy everything you can. If the world ends, no one will be around to make us pay. If the world doesn’t end, we’ll make a fortune.” He bought, the world didn’t end … and he made a fortune in his first month on the floor. That answer stuck with me for years. I think it’ll stick with you for years. It’s a guide for trading many crises. Financial markets are a real-time measure of how people react to history. Price changes record what traders believe will happen as historic events are unfolding. When war threatens, fear rises, and selling often escalates. That’s when smart traders buy. It was true in Korea. 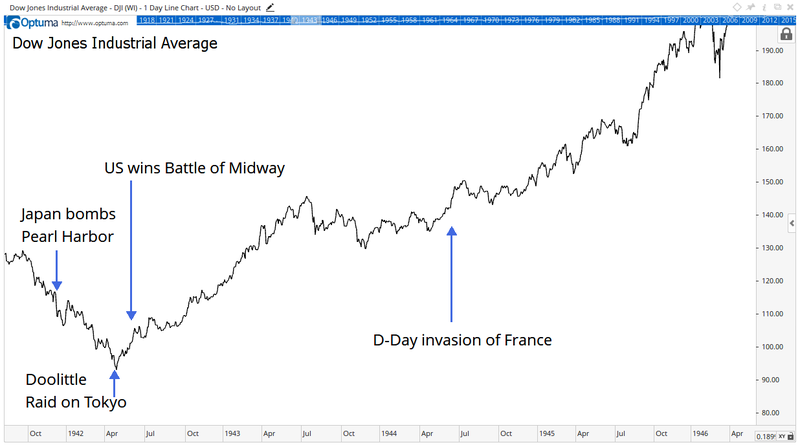 History shows that the Korean War was a time to buy. In World War II, the bombing of Pearl Harbor also led to selling. That time, selling continued for months. It took almost five months for stocks to bottom. Stocks rallied on the day that news about the Doolittle Raid broke. In April 1942, U.S. bombers successfully attacked Tokyo and other cities in Japan. The raid demonstrated that Japan was vulnerable to American air attacks. It was also viewed as retaliation for Pearl Harbor and provided an important boost to American morale. Both of those charts highlight that stocks rally when investors are confident of victory. The next chart shows what happens when the outcome is uncertain. 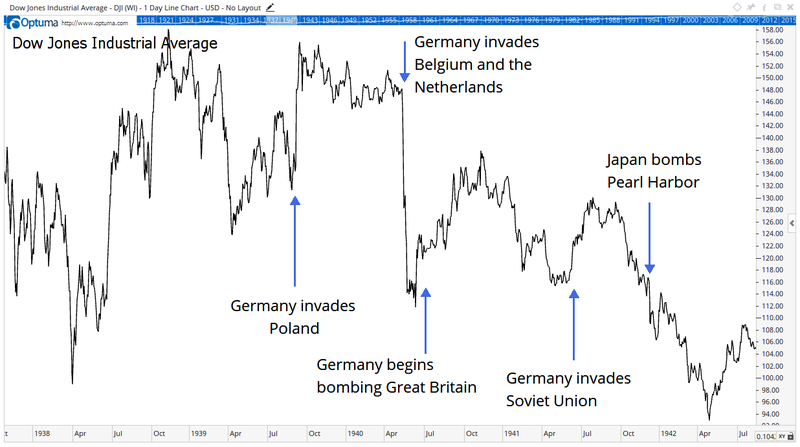 Germany’s early victories in the late 1930s led to market volatility. 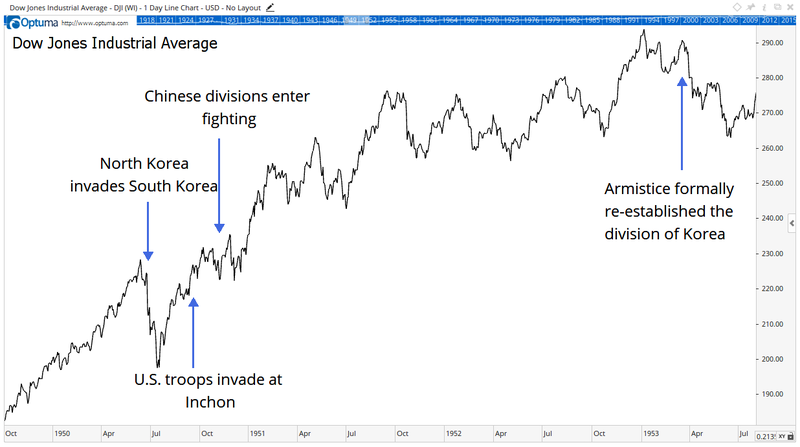 For now, the question is which pattern markets would follow if war begins in Korea. If war develops in North Korea, the results will be tragic. The amount of human suffering is difficult to comprehend. And it goes without saying that we should all hope for a peaceful resolution. For investors, the sequence is likely to follow a well-worn script. The initial days of conflict should lead to a sell-off. When the outcome becomes clear, stocks should rally. But the chances of war are remote. South Korea will not allow its citizens to needlessly be put in harm’s way, and that limits the chance of a land invasion of the North. The goal of the North Korean regime appears to be survival, and that limits the chance of a land invasion of the South. Much can be accomplished with cyberwarfare and economic sanctions. History tells us that devastating sanctions can be unilaterally imposed by the U.S. In 2005, the Treasury Department took regulatory action against a small bank in Macau that was accused of acting as a “willing pawn” for North Korea. Treasury officials used the Patriot Act to block the bank from the global financial system. The Treasury was making an example out of this bank to warn other banks. Financial institutions around the world got the message. They cut ties with North Korea to avoid losing access to U.S. financial markets. North Korea lost access to the international finance system. But the sanction was abandoned when the Obama administration took a different approach to the problem. With so much at risk, war is unlikely in North Korea. Sanctions can still work, and negotiations are possible.